we apology for ur inconveniences . will check it out Assp. Be here for good seafood and chilled beer along. This place concentrates on food preparations, services and how to keep costs down. Place becomes bit dark in the evening. Staff were friendly and services were prompt. Thanks u sir. Looking back u soon . Next visit pls tel before ur bill code TripAdvisor for ur discount. Very good place for dinning. It is a good place. Staffs are friendly. Foods are good. Opening from 12 AM. Near to city centre. Beach also not far. thanks u sir Plz check ur discount with front office next time u visit. Food is good; including local seafood dishes. Interiors especially the bar is extremely dark and shady. Can be avoided. Not a place to sit and have a drink. 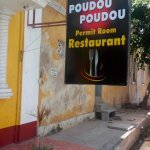 Been to Poudou? Share your experiences!